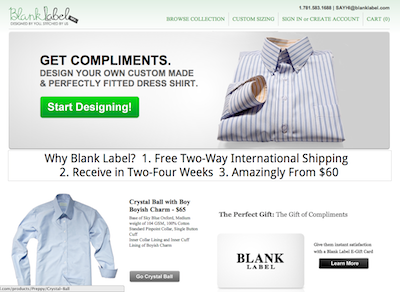 Blank Label is changing the way you shop by allowing you to become your own fashion designer. With our online designer application, you can co-create your own dress shirt with the styles you love at a fit that’s better than anything off-the-rack. Blank Label beats the competition by offering an incredibly comprehensive design-it-yourself dress shirt experience that’s fun and simple, while offering a product at a price that’s competitive with (in some cases more affordable than) off-the-rack shirts, so why not design-your-own? Next post: Sponzu.com – Watch Ads to Fund Ideas!